FenderLearn guitar online, with some help from Fender. 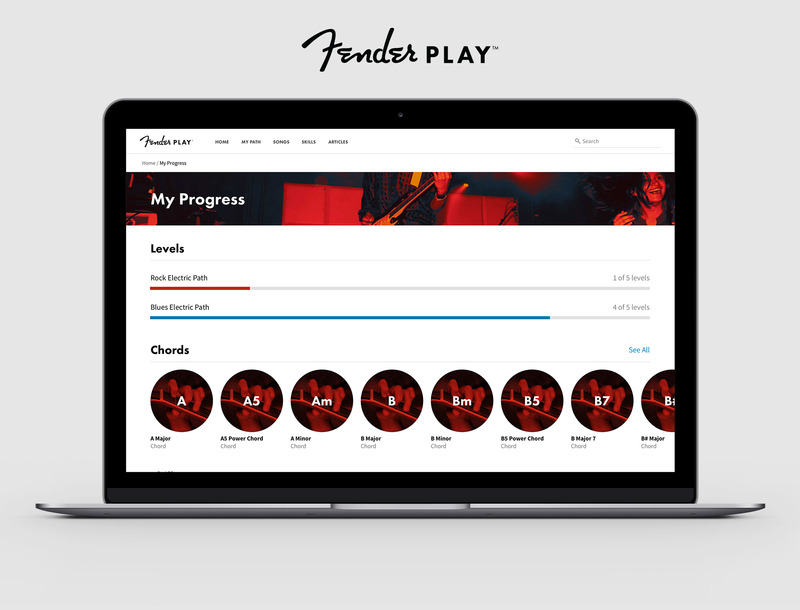 Fender Play is a new online learning tool from the legendary American guitar company. I spent a month using it to improve my skills. It’s a great program of instruction, but it might not be for everybody. It is very affordable, however. The guitar isn’t an easy instrument to play, and unfortunately for a lot of aspiring axewomen and axemen, there aren’t lots of shortcuts. Adding to the challenge is a sea of online instructional videos, ranging from excellent to awful, as well as many accomplished guitarists posting their efforts, which can be intimidating. Topping it all off is, of course, many decades of serious shredding recorded on vinyl, CDs, pumped through good old-fashioned radio, committed to film, and now streamed. It can be hard to know where to begin, and so a familiar pattern emerges: a person of any age, but usually a kid, gets a guitar, commences the struggle – and gives up. The world is full of abandoned acoustics and electrics that were acquired with high hopes, but whose owners ran smack into failure. The guitar industry is concerned about this. The bottom line is that if a guitar-maker can get a person to stick with it, they become a lifelong customer, graduating from $US200 beginner instruments to equipment that can run into the thousands. FenderYes, you can learn chords, a real basic. Fender is one of America’s two most famous manufacturers of electric guitars and amplifiers (Gibson is the other), and the company recently launched an online teaching resource, Fender Play, that’s seeking to reinvent musical instruction for the 21st century. I recently spent a few months using it, and I think it’s a good way to learn guitar using the internet. But it’s not a complete substitute for real-world lessons, and it can’t replace the basics, such as regular practice. Some background: I started playing music when I was about ten and was in school bands until my sophomore year of high school. I quit playing altogether in my twenties and only picked up the guitar a few years back because my daughter was learning to play. As it turned out, I really enjoyed it, and like many aspiring players, I decided I might take some lessons after I worked up a basic competency. Over time, this took the form of watching videos on YouTube. I quickly recognised why most people take up guitar, and it wasn’t anything like what I’d experienced when I learned to play music back in the 1970s. In those days, a simple set of skills was almost immediately thrown into a band setting, and performance followed. But now what people want, in a nutshell, is to learn their favourite songs. Some aspiring musicians certainly want to master a lot of technique and understand what they’re doing theoretically. But more want to essentially cover songs they like. 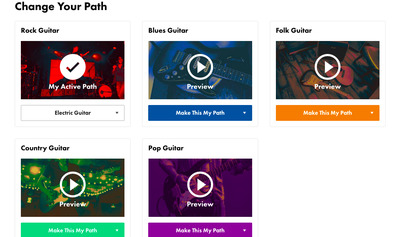 Screenshot via Fender PlayYou can choose your own path. To create a worthwhile e-learning program that students would be willing to pay for, Fender had to differentiate its offering from everything else out there. The everything else could be a guy in his basement fumbling through Led Zeppelin riffs with a laptop camera – or a trained musician in possession of excellent video-production abilities who can handle anything from classical guitar to AC/DC. Both have disadvantages. Basement guy isn’t likely to be a very good instructor, while the pro could overteach and quickly blow past a student’s patience. 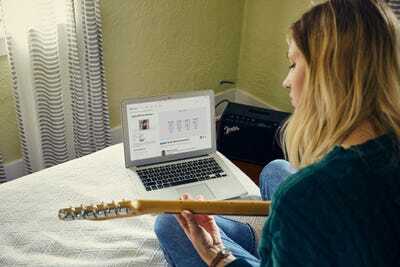 So Fender consulted with online-learning experts to develop a systematic program that mimics what you’d get from a live instructor, sands off all the rough edges of the YouTube world, and centres the education on getting results by learning songs. On balance, this approach wasn’t what I personally was looking for. I wasn’t much interested in learning a lot of songs; instead, I wanted to write my own songs and be able to use the guitar to work out the structure, melodies, and so on. I also wanted to pick up some jamming skills to get back into playing in groups. Nonetheless, I found Fender Play to be quite useful, because of how disciplined and well-organised it was. Screenshot via Fender PlayYou can keep track of how you’re doing. 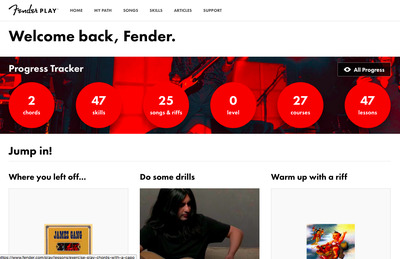 It costs $US20 a month to join, but Fender offers a 30-day free trial – and through December 31, special “holiday pricing” of $US9.99. You effectively have three roads you can follow, and you can jump around, although a lot of beginners might want to work gradually through the program. Fender Play is set up to enable them to track their progress. 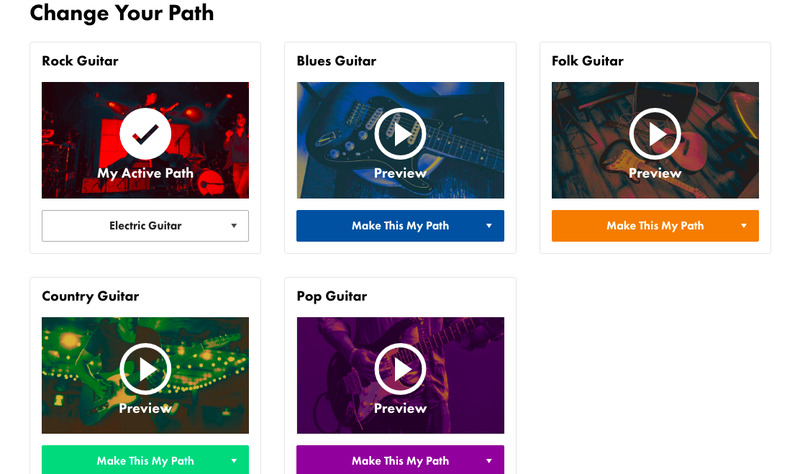 Initially, you’re invited to set up a path, based on musical genre and with some implications about your instrument. Rock, for example, stresses more electric guitar. Folk, more acoustic. You can then move through levels, learning basics, riffs, songs, and related skills as you move along. I deviated from the levels approach quite often and moved around, largely because I wanted to review the program, but also because I had already established a lot of basic skills. For skills I didn’t have or wanted to explore, quick lessons are provided. Interestingly, by taking some of them, I found that the skill wasn’t for me. Arpeggiating chords for example, when you “break up” a chord into the individual notes that make it up. A great skill to have, but one that I discovered I didn’t want to use. A human guitar teacher might have spent a few lessons working on arpeggiation with me, but with Fender Play, I could move on in a matter of minutes. The lessons are conducted as high-quality videos, using a rotating cast teachers, some of whom had online followings before they signed up with Fender. Yes, they are using Fender gear. But that was going to be a given, and there are worse things to do than gaze upon Fender’s iconic instruments. The instruction is the opposite of exhausting, and that’s by design. 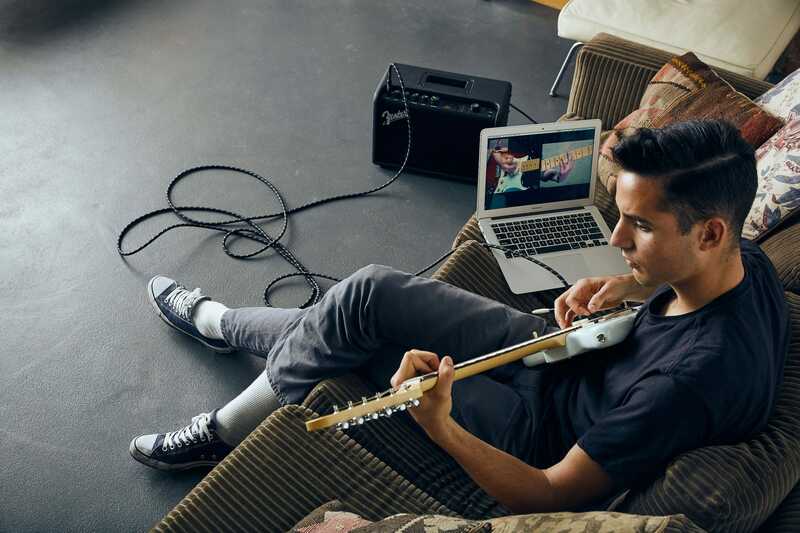 Online learning gets frustrating if it’s too in-depth, so Fender Play emphasises compact sessions, even going so far as to break down lessons in terms of time. A big plus to this is that a key to getting better as a guitar player – or musician of any sort – is to practice regularly. But you don’t have to practice for hours. A half an hour a day is terrific. Even ten minutes is worth it. No program of instruction will be perfect, and Fender Play isn’t going to work for everyone. But I think it will work for a lot of people. And for those who don’t like it, there are many free options on the web, and you can always hire a real, live teacher! The upshot is that a month of Fender Play made me better. I couldn’t get everything out of it. But I got a lot.